Perle 10 yr old bay Dutch dressage mare, Certus x Souvenir, 4th level Testimonial I got to ride Perle for the first time last Sunday. She is absolutely wonderful and has a great amount of potential. She is currently at my trainer’s farm in Millbrook, New York so he can figure her out and then train me to ride her properly. He gets a lesson each week from Lendon Grey and he rode Perle in his lesson.Lendon felt the horse could probably go Prix St. George by the autumn and that she has potential to go to the highest levels. I couldn’t be more pleased with Perle. Her movement is excellent when she starts to come through her back and she shows a lot of power. I am glad she has settled in well at the new farm and is very happy. She is turned out all day with a retired mare who is very calm. Thank you for the sheet. It is perfect and I really needed a bigger one for her. It fits her well. I am very happy with my purchase and felt I got a really exceptional deal for such a good horse. Thank you for making my dream come true. Euro is the greatest horse in AMERICA!!!! My trainer is in absolute love with him and he is the barn favorite. Everyone loves his disposition and the way he moves. I walked him around at a horse show on Sunday and he was absolutely fantastic. 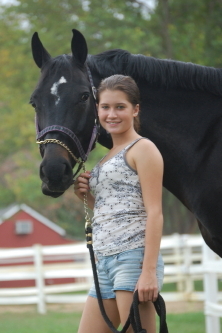 I show him for the first time in the 3’3″ equitation classes on Saturday! CANT WAIT TO SEE HOW IT GOES… I am taking him to his first away show next week. My trainer gave you a thumbs up!!! Will keep you posted! Ashley & Euro K WON THE MINI MACLAY MEDAL ON SATURDAY!!!!! It was their first time out together in a show ring and they were amazing!!!! They were meant to be together. I think he loves her as much a she loves him!!! They were so proud. He not only was performing for the first time in the USA but the poor guy had to go out under lights, in the dark, with huge generators ringside powering the lights making loud noises. He just melted in her hands & away they went. It was beautiful. They had to compete in 1 – over fence & 1-flat = mini maclay medal. There was 16 competitors. They WON!!!! “Ashley Regan riding Euro K taking the BLUE Ribbon”. There is no stopping them now!!! Orpheus is the best horse that I’ve ever had. He is so smart, willing and personable. My daughter loves him and our trainer Cindy Ishoy thinks they will be able to do YRs this season. I will send you pictures when we get organized. Thanks again! He was certainly worth the wait. In the horse world with so many disreputable agents you certainly are in a class of your own and I would use your services again in a heartbeat and recommend you to friends. all the horses in various parts of Holland. Thanks for your work. We had a great time. Laurel took Pippi to a clinic with Albrecht Heidemann, the Canadian junior trainer, from Germany and he thought Pippi was very high quality. Thanks for all you efforts!! Thank you so much for your time and thank Miranda for us as well. We are very excited. Thanks for all the good work! He is truly a dream come true!!! 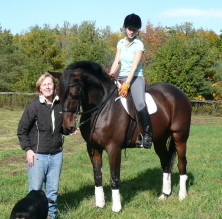 I have attached a photo of Romeo and I (he is such a love that we changed his show and barn name). He is everything and more that you told us about him. What a fantastic animal! I am so pleased with European Horse Trade. My trip to Holland was well organized. This was due to all their hard work before hand. They listen to my wants and needs and set up an amazing agenda of fine, quality athletic horses to be seen. I plan on continuing to work with these professionals for my equine business. 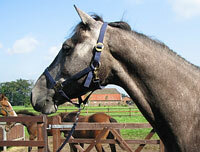 And I highly recommend them to help with your business or to find that special equine partner. sweet and very bombproof! I hope to have him home by mid April. I can’t wait to start training again and he will be a great teacher. Once home, I will get some good photos. He was a very lucky find. I worked with this great group that searched for the perfect horse for me. We saw him the first day. 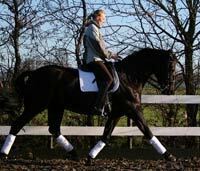 Kees is soft as butter in the reins…he is easy to sit…he has the most even-tempered temperment…not spooky at “anything”!!!!! Mirrors in the arrena, long-horn cows, deer…nothing so far seems to bother him!!!! And he’s easy off my leg so I can finally do a half-pass correctly!!! I’m soooooooooooooooooooooooooooo pleased!!!! IF you find another one, that is JUST like him….let me know…I may have to do another one in my barn soon! He was EXACTLY as you described to the tee! I will send photos! I hope to acquire my Bronze Medal this year on him! Thanks soooo much for everything! Our trip to Holland to find a horse was terrific! We loved the country, we loved the horses, we loved Tiny and her husband. 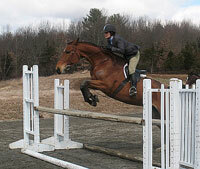 Nike, our Dutch Warmblood gelding, has proved to be everything we hoped he would be, and more. He has changed our lives, and all for the better! 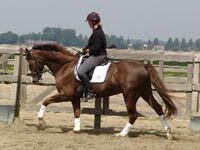 Thank you so much for all your help and support in helping me in finding a wonderful new horse. I will be sending pictures later of his new house. Only three weeks after he came home, True North won his hunter class in an A-circuit recognized show!! I cannot thank you enough for the amazing experience you showed myself and my client in Holland. With our limited budget and time constraints I honestly was skeptical that we would find what we wanted. The large selection you provided us in a long weekend was something I could never do here in the states. 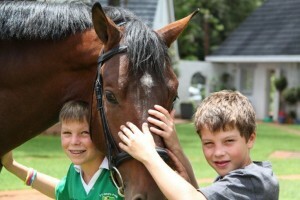 The horses we purchased were exactly what were looking for and more. I would highly recommend your service to anyone. The horse is a blast to ride and has taught me more in 2 weeks then I have learned in 2 years. The benefit of having a calm, trained horse is the rapid growth and feedback you get in your riding. He really fits my learning needs and I feel very fortunate to have the opportunity to own him. He is the perfect AA horse. I was very impressed with the ease in which he settled in and I am fortunate that he has accepted his new life and new “job” with grace and compassion. Training with Nancy Later has also been very rewarding and I will miss her when she goes to Florida. Could you talk her into leaving in November? 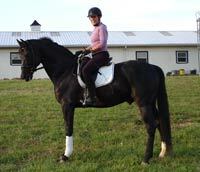 Nancy will use Marcel at the Bear Spot dressage fund raiser in October. 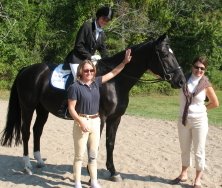 A young rider will get an opportunity to ride him and have a lesson with Nancy. I do hope to meet you in person and fill you in on my Marcel moments. Thanks for finding this great horse. Hi Sarah and Miranda! 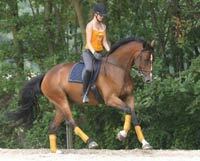 I just wanted to let you know that my new Holland horse is AMAZING! Vindoctros’ new name is Eur-Honor. And he loves his new home. Eur-Honor is the best horse ever! From the second he walked off the trailer and into his new farm in New Jersey, he has been such a gentleman. Nothing bothers him. He has such an easy going attitude towards everything! Eur-Honor went to his first horse show last weekend. I showed him in the 3? ft mini medal and mini mcclay classes and he was so perfect! He is the best horse I have ever ridden and it is all thanks to Miranda and Sarah! Traveling to Holland was the best experience I have ever had. And now I have a new best friend and show companion for many years to come. I can’t thank you guys enough for this amazing horse! Just a note to let you know that Freibitter [Zoltan] arrived safely today at Dry Water Farm. He was in quite a good humor for such a long ordeal, and I’m already in love. ;>) He was happily eating carrots, and apple, and his hay when I left him tonight. Thank you for calling me today to let me know Zolli was on his way, and generally, thank you and European Horse Trade for all of your help with this purchase. 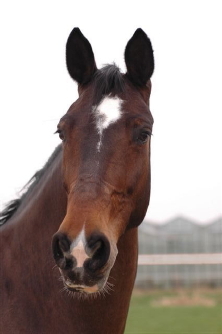 I would warmly recommend you to anyone who wants a horse. Relay this message to Tiny and to Miranda for me, if you don’t mind. Those ladies were tremendous! Thank you for everything! Of course I will keep you posted on Zoltan’s [and my] adventures. As you can see, it’s 4am and I can’t sleep, I’m so excited. Am enclosing two pictures we took today on his arrival. I want to learn as quickly as I can so that I can be a good rider for him. He has a wonderful nature – cuddly – quietly confident and forgiving. Just to let you know that I am more than delighted with my Willy (Prince William) I could not dream of a better match. He is fun, joyful and knows his job, besides such a cute mover when we are on. 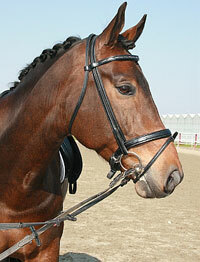 Starting with you I have met the most wonderful prfessional and kind people in my quest for an equine partner. I am back in a traditional learning experience and I enjoy every minute of it. Nancy Later at first and then Lena Wedenmark are fulfilling my dreams of what dressage instruction should be : kindness and respect for the horse first and then rigour in a clear and gentle way for the rider. Nancy guided me all the way after having met her through your company. We went from finding the horse to trying him twice, she took care of arranging the vetting, the insurance and took me to her barn for a 2 weeks of training getting to know my equine partner and establishing a routine before he would go to his permanent stable. The experience was one of the most enjoyable time many thanks to you because you initiated it in such a professional manner. I will always be thankful. Willy is a pure treasure. Again thank you and all the best wishes for you and your business. 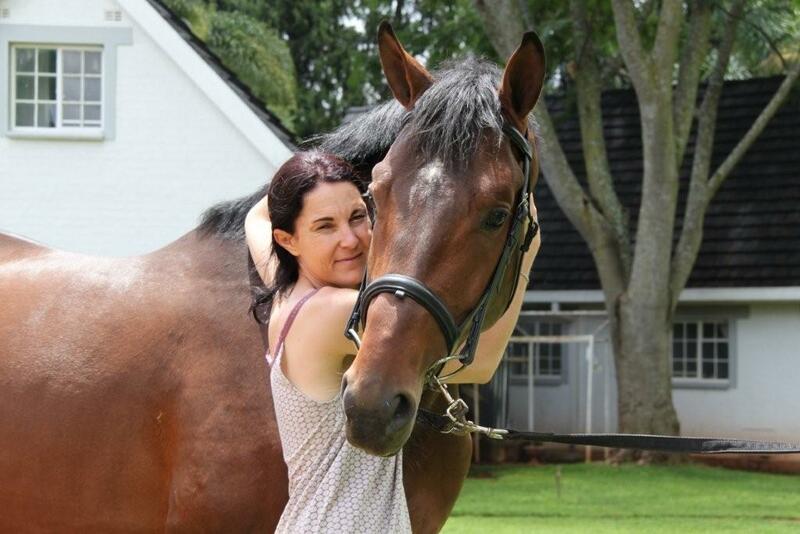 I found Sarah by chance as I was contacting warmblood stud farms in Europe and a lady in Spain forwarded my email to her and Sarah contacted me. She said she was a dealer and I told her my budget which was certainly not very high, as I still had flights etc to Zimbabwe. Just to add to that I told her I wanted the best breeding and a horse that will jump in World Cup Qualilfiers or do PSG!!!! 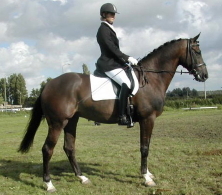 What she found me may not be the best bred three year old in Holland, as that would have cost me €300’000 but I certainly got a stallion who I believe will jump the top in South Africa and will be a top competition dressage horse there too, if I chose either career for him. It is early days and sure he has to prove himself but at the moment he is showing all the potential. 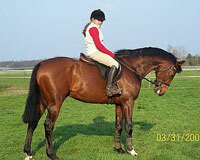 I bought him from a video of him trotting loose around an arena, a free jumping video and on his breeding. He also had clean x rays for soundness and obviously breeding purposes. Sarah has been completely honest, efficient and 100% trustworthy. She treated me as though I was buying a horse for hundreds of thousands of Euro!! Maybe next time Sarah! She put in so much time and effort into finding me the right horse and never got impatient with me if I was fussy about colour, markings, potential height, more importantly the exact breeding i wanted, conformation etc. She thought about everything. She found me a stunning stallion. I could not believe what I was looking at when he stepped off the crate onto the airport Tarmac in Zimbabwe. I can honestly recommend her and wish you the best of luck with your new purchase.